Library War is set in an alternate future Japan, where all forms of expression are strictly regulated by the Media Betterment Act. Libraries are the only oases of free thought, which puts them under constant threat by the government's Betterment Special Agencies. The only ones capable of opposing them are the Library Forces, militarized prefectural organizations that protect the content of local libraries for the sake of the people. After a dangerous brush with government forces and salvation by a mysterious "prince," a young girl named Iku Kasahara is inspired to join her local Library Force. Although Iku clearly has the skills, she leaves a lot to be desired in the discipline department: a source of both amusement and irritation to her instructors and squadmates. Balancing harsh training, interpersonal drama, and political intrigues, Iku and her team repel aggression from all those who would seek to threaten the freedom of speech represented by their local libraries. 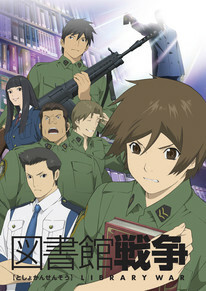 Adapted from Hiro Arikawa's award-winning light novel series, Library War is at once a work of serious speculative fiction, and an ensemble adventure examining the sometimes comedic, sometimes tragic situations faced by a colorful group of young men and women in a near-war situation.